Loquita, an ode to the roots of Santa Barbara’s culture and a favorite among local food lovers and travelers who herald the restaurant’s inspired Spanish cuisine flavored by the Central Coast’s rich ingredients, celebrates the wines of Spain with a new bar and wine program that is timed for holiday gatherings and celebrations. Porron Hour is offered weekdays from 5:00 – 6:00 p.m. and guests can discover and challenge their palates with varieties of exceptional and lesser-known Spanish wines. A Porron is a traditional Spanish wine pitcher that holds .75 litres and is used predominately in the North-Western part of Spain – Catalonia, Aragon and Valencia. Porron hour features four distinguished varietals, 2017 Avinyo “Petillant” Cava; 2017 Columna Albariño; 2017 Menguante Garnacha; and 2015 Finca Torremilanos “Los Cantos” Tempranillo, priced at $20 per Porron. Loquita’s Spanish Sherry Flight presents this unique Spanish wine made from white grapes grown near the city of Jerez de la Frontera in Andalusia, Spain. It’s produced in a variety of styles made primarily from the Palomino grape, and ranges from light white table wines to darker and heavier versions such as Amontillado and Oloroso. The flights are available nightly at the bar or table and are the perfect complement to Chef Peter Lee’s Spanish cuisine. 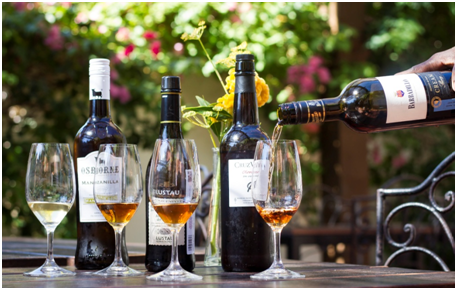 The Spanish Sherry Flight includes four 1-ounce glasses of some classics – Osborne Manzanilla, Sanlucar Barrameda; Lustau “Almacenista Obregón” Amontillado, El Puerto; Faustino Gonzalez “Cruz Vieja”, Oloroso en Rama, Jerez de la Frontera; and Barbadillo, Cream, Jerez De La Frontera, priced at $16 per flight. And just in time for the holidays and beyond, Loquita launches the Loquita Wine Club. Each quarter, Medina selects wines from renowned regions of Spain, including world-class producers from Rioja, Priorat, Ribeira Sacra, Bierzo, and the Canary Islands. Selections will showcase diverse climates, winemaking techniques, both modern and traditional, and include information about each producer and the terroir represented. 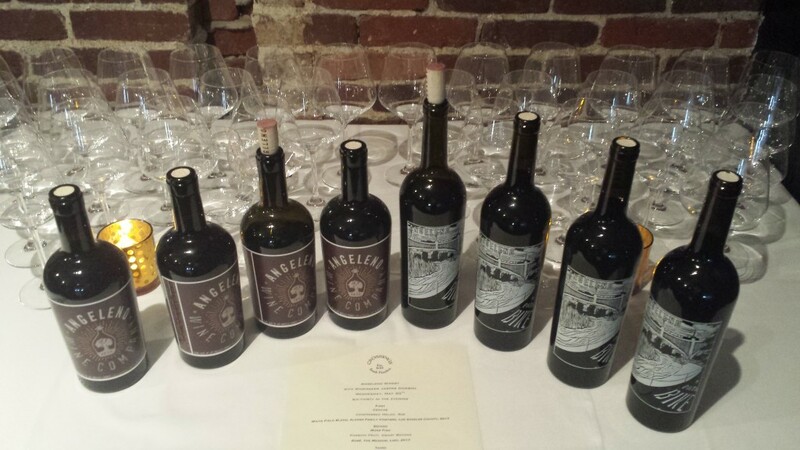 Loquita Wine Club membership includes quarterly shipments of three bottles. Pricing is $75 – $95 per shipment plus tax and shipping charges. For more information call the restaurant at 805.880.3380 or email info@loquitasb.com. Manzanilla is a variety of Fino Sherry and similar to our Valdespino. Produced in this seaside town right on the coast makes it similar to making Sherry in Santa Barbara. The influence of the ocean changes the way this Sherry tastes and one perceives more salinity – it tastes like the ocean and pairs perfectly with the seafood at Loquita. Amontillado Sherry is slightly richer and nuttier. It spends an average of four years under the protection of flor yeast which keeps it safe from oxygen. Halfway through its aging, the yeast is deliberately killed to allow the wine to oxidize briefly. This oxidative aging brings out nutty flavors and changes the fruit characteristics to a darker, baked pear note. This one is the perfect pairing for Loquita’s Bellota and Jamon flight. Oloroso Sherry takes oxidative aging one step further. Oloroso Sherry is made in such a way that flor never grows on the wine. The wine spends its entire life (about 15 years) breathing with the barrel. This gives the wine an intense sumptuousness. The aroma becomes very nutty, and fruit notes begin to seem dried, like raisins or figs. The wine still has bright acidity and a bit of spice which makes it incredible with fuller-flavored, fattier dishes like Loquita’s Vieras and Secreto. Sherry and 30% Pedro Ximenez. It rivals the decadence of Pedro Ximenez Sherry but is much more elegant with notes of candied hazelnuts and fig jam. Loquita Wine Club – Unase al Club (Join the Club)! Each quarter, Loquita selects wines from renowned regions of Spain, including world-class producers from Rioja, Priorat, Ribeira Sacra, Bierzo, and the Canary Islands. Selections reflect diverse climates, winemaking techniques, both modern & traditional, and include information about each producer and the terroir represented. À la carte dinner available from 5:00 p.m.
Loquita, an endearing Spanish colloquial term for a wild, fun loving young girl, is Acme Hospitality’s playful love letter to the Spanish history of Santa Barbara. Leading the culinary team is Executive Chef Peter Lee, with an impressive resume including award-winning Jöel Robuchon in Las Vegas, Gusto and Osteria Mozza in Los Angeles. The wine list is comprised almost entirely of Spanish wines and several exceptional local wines that pair well with the cuisine. Loquita’s cocktail list showcases selections of Spanish vermouths, farmers’ market Sangria, hand-crafted cocktails and the de rigueur offerings of gin-and-tonics, Spain’s king cocktail. The Mediterranean climate and terroir of Santa Barbara County mirror that of Spain, making the translation of locally sourced produce, meats and seafood an ideal match. Down the hallway is Poquita, a standing-room-only pintxos bar, with displays of Spanish Jamon Serrano, Manchego cheese, Manzanilla olives, tapas and pintxos (small bites). Loquita’s recognition includes features in Eater, Coastal Living; C; Westways; Wine Enthusiast; AFAR; Travel & Leisure; Tasting Table; Restaurant Hospitality; Zagat; The Infatuation; Santa Barbara; 805 Living; Santa Barbara Life & Style; LA Weekly; Oakland; Darling; and awards for America’s Best New Restaurant, 3rd place, USA Today; and the Spain in Santa Barbara Foodie Award, Santa Barbara Independent 2017. 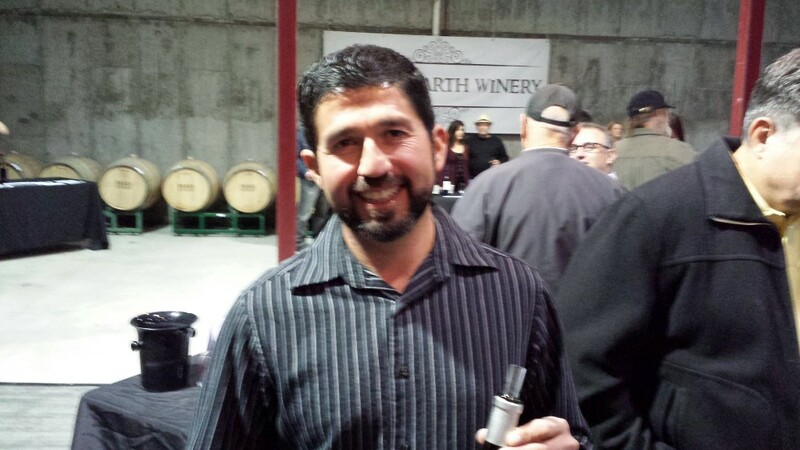 In 2016, reporting on the Los Angeles edition of the Garagiste Festival, I singled out Rhythm Wines as a “winery to watch”, especially enjoying the 2015 Tannat from the local Alonso Family Vineyard. Then, I lost track of them. 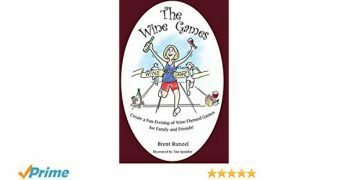 Eve received an invitation to attend a winemaker dinner at Crossings restaurant in South Pasadena featuring the wines of Angeleno Wine Company. Eve was busy partying – um, I mean researching – in New Orleans, so her loss was our gain. Karen and I were delighted to take her place but I was unfamiliar with the winery. A quick internet search followed and I was soon looking at the faces of Jasper Dickson and Amy Luftig Viste from that 2016 Garagiste Festival. With the focus now primarily on the Alonso Vineyard, they are working on opening their winery and tasting room in Downtown Los Angeles. Established in 2013, Crossings occupies the historic [built in 1908] Edwards and Faw building in South Pasadena. With dining rooms on two floors and the wine loft in between them as well as a patio, Crossing is visually stunning. The only question was: would the food match? We were about to find out. Hosted by Crossings’ Proprietor Patrick Kirchen, Chef Kevin Malone and Wine Ambassador Chris Sweeney along with Angeleno’s Winemaker Jasper Dickson, the challenge to create perfect pairings was not only met but exceeded. With Angeleno’s focus on LA County’s wine history, Chef Kevin developed a Latin-inspired menu that not only paid homage to the heritage of Los Angeles but also to Juan Alonso’s and his vineyard’s Spanish roots. The first course, a ceviche with compressed melon and roe, also had habanero powder sprinkled on it. The heat from the habanero was cut by the balanced acidity of the Angeleno 2017 White Field Blend of mostly Spanish varietals from Alonso Family Vineyard. Next up, quail with mole, yolk and herb salad. This dish was not only delicious but ingenious as well, with the quail and quail egg in the same dish [raising the chicken and egg question in its own way]. The richness of the mole went perfectly with the 2016 Grenache from the Alonso Family Vineyard. The final course [before dessert] was pork belly [yum!] with tamarind, jicama and hibiscus. Pork belly, of course, is very rich. The jicama cut through that perfectly. This was naturally paired with the heaviest wine of the evening, an excellent Tempranillo and Garnacha blend called “Bike Path”, also a 2016 from the Alonso Vineyard. Dessert was a churro with queso Oaxaca, guanabana and honey. Pairing the cheese with the sweet dessert provided great contrast and the dish was all brought together with the 2016 “Superbloom” blend of Albarino, Riesling and Chenin Blanc, for the perfect ending to a fabulous meal. Crossings does special events frequently. But you don’t have to wait for an event to check out Chef Kevin’s food or the killer wine list that Chris has put together. Check out the Crossings website for details. And stay tuned for more information on Angeleno Wine Company. I really shouldn’t take credit for making this meal. I shopped for it, washed and prepped some of the veggies, opened the wine and set the table. My daughter Sam selected the recipe and made the dish, along with some help from dad, while I was banished to my office. Which, as it turned out, wasn’t a bad way to go. The recipe is below. The only changes we made are in italics. 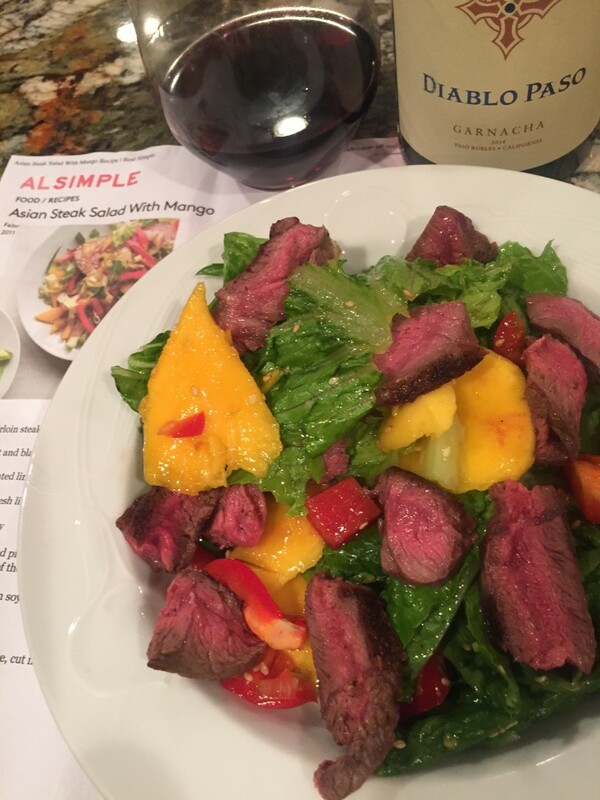 I selected a 2014 Diablo Paso Garnacha to pair it with as I wanted red for the meat, but something lighter to go with the fruit and dressing. Heat a large skillet over high heat. Season the steak with ¼ teaspoon each salt and black pepper. Cook 4 to 5 minutes per side for medium-rare. Let rest at least 5 minutes before slicing. Meanwhile, in a large bowl, whisk together the lime zest and juice, honey, ginger, soy sauce, oil, and ¼ teaspoon salt. Add the lettuce, mango, bell pepper, basil, and scallions and toss to combine. (I would make this salad dressing again, very tasty!) Gently fold in the steak and sprinkle with the sesame seeds. New York, NY – On the third Friday of September, fans of the Garnacha grape will once again raise their glass to this rising star in honor of #GarnachaDay, this year on September 16th, 2016. Garnacha, the only mainstream varietal with red and white variants, produces a great variety of wines, which speak loudly of their place of origin by clearly transcribing their respective terroirs. Also known by its French nom de vin, Grenache, Garnacha now reveals its best expression in its birthplace – the five Protected Designation of Origin (PDO) regions of Calatayud, Campo de Borja, Cariñena, Somontano and Terra Alta – where a new generation of winemakers has risen to offer improved ways of producing Garnacha-varietal wines. By controlling yields, taking advantage of old vines’ concentration, and combining modern techniques with ancient traditions, these regions have emancipated the grape from its common use in blends to show it can stand on its own. A light, crisp and mineral white Garnacha is characterized by flavors of apple, peach, lemon and quince, making it a great partner for summer salads or seafood dishes, including raw shellfish, paella, or pasta with clams. A plumper, richer and rounded style will display citrus oils, honey and melon, making it delicious alongside glazed ham, fried seafood or chicken, seared scallops, or melon and prosciutto. A fresh, fruity and bright red Garnacha usually features flavors of strawberry, raspberry, cherry and pepper and pairs well with Indian curries, marinated olives, burgers and chorizo. A fuller-bodied Garnacha will show more robust and concentrated flavors, including those of blackberry, currant, allspice and tobacco. Pair it accordingly with foods that can stand up to its power; such as barbecued ribs, pulled pork, grilled sausages, or lamb chops. Delicious, fruity, refreshing, rosé Garnacha wines features flavors of strawberry, watermelon, rhubarb and roses. Enjoy its youth alongside fried fish, grilled tuna, barbecued chicken, chicken salad, pasta, pizza and charcuterie. Accessible, friendly and fun, Garnacha wines are a symbol of Spanish culture and are meant to be shared with others: discover tastings happening near you, by visiting www.winesofgarnacha.com, and show us which Garnacha wines you taste by using the hashtag #GarnachaDay across social media. Wines of Garnacha is the official campaign regrouping producers from Garnacha’s birthplace – the five Protected Designation of Origin (PDO) growing regions Calatayud, Campo de Borja, Cariñena, Somontano and Terra Alta – joined with the Spanish Ministry of Agriculture, Food and Environment and the European Union. Its primary mission is to promote Garnacha Wines in key export markets, by raising awareness of the grape’s origin and of the new production approach used to make mono-varietal wines. Wines of Garnacha has once again joined forces with the International Grenache Association to unveil and celebrate the grape’s true potential. For more information, please visit www.winesofgarnacha.com. Hard to believe that this is already the 5th vintage of the Garagiste Festival held in Paso Robles every year since 2011. 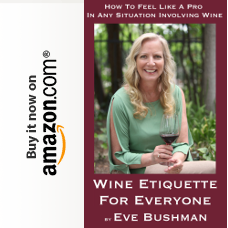 We reported on it back then and have continued to keep Eve’s Wine 101 readers updated on the Paso event as well as sister events in Solvang and Los Angeles. As the years have gone by, the Paso Robles event has expanded into a multi-day extravaganza, with winemaker dinners, seminars, mixers and, of course, the main event. Attendees can buy the entire package or opt to pick and choose from the menu of choices. The Garagiste Festival started out primarily as an event showcasing the small wineries of Paso Robles, although even at the beginning there were participants from out of the area. 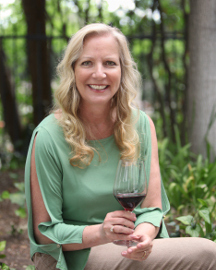 As the festival has expanded, especially with the addition of the Solvang and Los Angeles events, and became known as one of the premium California annual wine tastings, more participants come from outside of the Paso Robles area. Some of these, such as Alta Colina, Caliza, Kaleidos, Rendarrio, Vines on the Marycrest, Ranchero Cellars and Stanger, have been Garagiste participants since the first year. Rounding things out, Bristol Ciders of Lone Madrone Winery was pouring hard cider. In spite of all these great wines being poured, perusing the Garagiste website makes me feel that I should have attended the main event also. Hopefully, next year we’ll make a weekend out of it. We were planning our trip to Boston for my wife Karen’s family reunion. I was trying to come up with a good restaurant to host a dinner for some of the family members. I knew I wanted seafood and wanted a place that would be convenient for people to get to without having to deal with downtown Boston traffic. Sandy is Vice President of Beverage Operations at Legal Sea Foods. In 1992, he became the first American on the East Coast of the U.S. [and third in the entire U.S.] who earned the Master of Wine designation. Sandy joined Legal Sea Foods in 2004 and really “upped the ante” with regard to the restaurant’s wine program. Sandy has focused on creating an outstanding wine selection that complements Legal Sea Foods menu offerings, as well as creating a course [Beverage Seminar Certification Series] for Legal Sea Foods’ beverage managers, which many of the restaurant’s chefs, servers and general managers take as well. So, Legal Sea Foods was the choice. As I said, they have multiple locations, and we chose the one in Chestnut Hill. Our server Tom was outstanding and the food was delicious. The calamari was incredibly fresh and perfectly seasoned. I ordered the gazpacho, which you might think of as an odd choice for a seafood restaurant, but this was one of the best gazpachos I have ever had, with great vegetable flavors coming through in every spoonful. And while I was pretty full by the time I got to my main course, the flounder I ordered was delicious as well. 2011 De Morgenzon Dmz Chardonnay Western Cape, South Africa – very tasty South African Chardonnay, classically rich and oaky, better than many I’ve had at twice the price. Matched very well with the calamari appetizer. 2010 Alto Adige Lagrein Rosé – Lagrein is a red grape that originated in Italy. I’ve had a couple from California, but never one actually produced in Italy, and this was my first rosé from this grape. Light and refreshing, and perfect with my wife Karen’s scallops as well as my gazpacho. 2007 Embruix de Vall Llach – a red blend from Spain, consisting of Garnacha, Carinena, Cabernet Sauvignon, Syrah and Merlot. Absolutely delicious, and stood up well to the richness of the flounder. So, with great company, terrific food, wonderful service, and a wine list put together by a true Master, I highly recommend Legal Sea Foods. Michael Perlis provides outsourced controller services to businesses that do not need a full-time controller. He balances this with his interest in wine: reading and writing about it and, of course, drinking it. He is still trying to figure out how to combine these two pursuits. Feel free to contact him about either at mcpfinancial@aol.com or michaelthezinfan@aol.com.